In this tutorial, we show you how to recover accidentally deleted email in Outlook.com if you have removed them from your Inbox as well as from the Deleted folder. Well, it seems a bit ridiculous, but you may sometimes find yourselves in the ridiculous position of having accidentally deleted email messages. Or it may be that your account has been hacked and all messages deleted. Most email clients contain a Deleted Folder where all deleted email messages go, and you can simply head over to the folder to retrieve the deleted message or messages. However once you’ve cleaned up your Deleted folder, or the folder has been purged ( Deleted folders usually automatically purge at regular intervals, retrieving such deleted messages are a much harder task. If you are using the popular email client Outlook.com, you just might be lucky enough to get back that lost email. Here’s how. 1. Navigate to the Deleted Folder. 2. Scroll down to the bottom of the folder and click the link recover deleted messages. 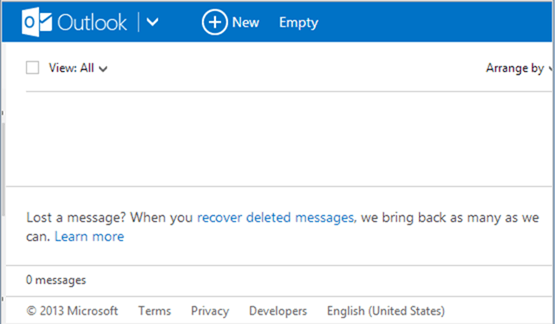 Outlook.com will now try and recover deleted email messages from the folder as it possibly can and put them back into the Deleted folder. Once you get back the email, you can move it to a folder of your choice. If however, the email message you are looking for could not be retrieved using this method, you will have to contend without the email. If you are a parent and have deleted email messages from a child account, you can be assured that this feature does not work on child accounts. So if a message has been deleted from a child account, it stays deleted and cannot be retrieved. So the next time you want to retrieve deleted email, be rest assured that you have a good chance of retrieving it, if your email web client is Outlook.com.